Will dryer sheets or eating special herbs and spices, garlic, vitamin B-1, or bananas ward off biting insects? There is a long list of “repellent” urban legends, including these. NONE of these approaches work reliably. If you want to be protected from insect and tick bites, use a DEET-based repellent. Do herbal oils, skin lotions, “natural” plant extracts mixed in oil, and homeopathic approaches repel biting insects? Most of these work for about 20 minutes and are no more effective than smearing cooking oil on your skin. These are simply “barriers.” Mosquitoes don’t like the feel of them and will leave. Once the oil is absorbed into your skin, the bugs will be back. Some essential oils are touted for their ability to repel mosquitoes, but these have not been tested for safety and just because they are plant-derived does not mean they are safe. There are many plants that should never be put on the skin or eaten. Make sure any product you pick has an EPA registration number to be sure you’re getting a product that works and has been evaluated for safety. In the prestigious New England Journal of Medicine, Richard J. Pollack, Ph.D. Does DEET cause seizures in children? This recurring rumor is without scientific foundation. Extensive follow-up of a few reported cases (out of the hundreds of millions of uses of DEET over the same seven-year period) found pre-existing neurological conditions and other unusual circumstances, typically including product misuse. None of these episodes could definitively be attributed to DEET. There was no correlation between the person’s age or the amount of DEET in the product. See article: DEET-based insect repellents. The American Academy of Pediatrics and other medical and science experts have reviewed these findings. Most experts recognize that neurological episodes occur naturally in humans at a rate higher than the incidence reflected in these reports. I have read something about DEET causing neurological symptoms in laboratory animals in studies at a well-known university. What’s that all about? The researcher conducting studies used DEET mixed with known neurotoxins, so a neurological finding is not unusual or unexpected in this instance. The question is whether the results were caused by DEET or the other chemicals in the mixture. This research has been questioned by many and never replicated. The format of the study has been reviewed and found wanting (too few animals were tested, conclusions were drawn based on a pathology review that was not the protocol most scientists would use, etc.) Requests from other scientists to review the study materials were denied, which is highly unusual. For a discussion of this study, see B.S. Jortner "The Return of the (Dark) Neuron". A Histological Artifact Complicating Neurotoxicologic Interpretation. Abstract No. 1909. 2005 Society of Toxicology meeting, New Orleans, LA. Can DEET-based repellents be used on children? The Center for Disease Control and Rrevention (CDC), the American Academy of Pediatrics (AAP), and other medical experts recommend the use of EPA-registered repellents for children. DEET-based products fall into that category. The AAP says that DEET-based products in concentrations of 30% or less can be used on children as young as two months of age. Parents should apply these products if the children are too young to read and understand the product application label. For children traveling in the U.S. or abroad to areas where dengue, malaria and other devastating mosquito-borne diseases are endemic, medical professionals agree that higher concentrations can be used. There are a number of mosquito-borne diseases such as LaCrosse Encephalitis and Eastern Equine Encephalitis found here in the U.S. that, while infrequent, can be deadly. West Nile virus (WNV) is now endemic across the U.S. In 2007, the youngest person to contract WNV was just three months old. WNV can cause life-altering effects and sometimes its victims die. West Nile Virus incidence in the U.S.
West Nile Virus (WNV) is found through out the continental United States and in all Canadian Provinces. The most serious form of the disease is neurological and results in encephalitis and meningitis, both infections that cause serious, sometimes deadly, brain inflammation. Survivors often have lingering symptoms including paralysis, blindness, and memory problems. WNV fever is less serious, but its victims can be sick for many months before recovering. The CDC reports that those with high blood pressure and diabetes are at greater risk than the general population for contracting the more serious forms of WNV. Those older than 50 are also at greater risk, but the disease can afflict individuals of all ages and in 2007 victims ranged in age from 3 months to 90 years of age. What is the best way to apply DEET-based repellents on a child? Put repellent on your own hands and smooth it evenly over the child’s exposed skin. Don’t apply under clothing unless insects are biting through it. Use a concentration that matches the time the child will be outside—a 7% product provides about 90 minutes of protection. A 30% product lasts 4-5 hours. Never spray repellent on or near the child’s face (to avoid inhaling the repellent). Reapply when insects start biting again. Do not put repellent on the hands of very young children who tend have their fingers in their mouths often. Read and follow product label instructions. You can also visit the Web site of the manufacturer or www.deetonline.org. The latter has a video showing application on children. If children are using a lower concentration DEET-based repellent than their parents, be aware that they’ll be bitten SOONER. So keep an eye out to help keep them protected. What’s the best way to avoid tick bites? Wear long pants, with cuffs tucked into your socks. Apply DEET-based repellent to exposed skin AND to pants below the knees and tops of your socks. Use repellent with at least a 20% DEET concentration. Once you return inside, do a thorough tick-check. Some ticks are very small and hard to spot. 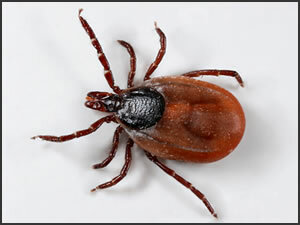 If you remove a tick within a few hours, chances are it won’t have transmitted disease to you. If the site of the bite becomes inflamed or you experience flu-like symptoms, visit a physician immediately. Tell him/her you had a tick bite. Ticks are small, some the size of a poppy-seed, and hard to spot on your skin. Do thorough tick checks every time you come inside. Most people who get ticks on themselves have never ventured beyond their own backyards. Can pregnant women use DEET-based repellents? Medical experts suggest that the risk of insect-borne diseases, such as West Nile virus, to the unborn child can be serious. So, they recommend that pregnant women who live in areas where WNV is prevalent use insect repellent. Of course, women should consult their own physicians. Click here for a review of 77 women who got WNV when pregnant and information on the outcomes for them and for their babies. What DEET-based product is the best to use? All DEET-based repellents work exactly the same way–by interfering with the mosquito’s ability to detect carbon dioxide and specific odors that they can sense The difference is how LONG they will keep bugs away. It’s best to select a product based on how long you will be outside. A lower concentration (7-10%) will last 90 minutes or so. A 100% product will last 10-12 hours. Some sustained release products have a concentration of 25% and last up to eight hours. The key is to use the lowest concentration based on your planned activity. For protection from ticks, use at least a 20% concentration product. What are the most common side effects associated with using DEET? DEET and other repellent ingredients will sting the eyes. This goes away immediately when you flush your eyes with water. Very rarely, some people develop a skin rash. It clears up quickly when the repellent is washed from the skin. This may be related to other ingredients in the formulation. Anyone routinely sensitive to cosmetics, fragrances or shampoos, etc, should try a small amount of an unscented DEET-based repellent on the underside of the wrist to see if there is a skin reaction. Can DEET-based products be used on dogs and cats? It’s best not to do so, because pets will lick their fur and could potentially ingest DEET. Companion animal products such as Frontline® and Advantage® are specially-formulated insecticides that ward off ticks and insects. These do not contain DEET. Consult your veterinarian for information about these products. Some fly-spray products for horses do contain DEET. However, experts recommend vaccination for West Nile virus for horses, since this disease is often fatal to them. There are no vaccines to protect people or companion animals from WNV. Can DEET be used with sunscreen? When DEET and sunscreen are applied at the same time, the effectiveness of the sunscreen is diminished. 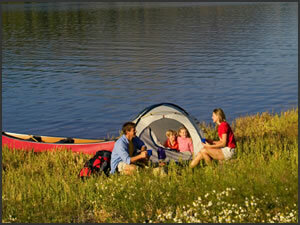 It’s best to apply sunscreen, let it absorb thoroughly into the skin and then apply the DEET-based repellent. Reapply sunscreen often and lavishly. Re-apply repellent only when insects start bothering you again. No. Exhaustive testing shows that DEET is not a carcinogen. It has been classified as non-carcinogenic by the Environmental Protection Agency. I have products that are three years old. Should I throw them away? This can vary by product. DEET products can last three or more years when stored in a cool, dry place. The DEET in them will not change character or composition over time. You should consult the manufacturer of your particular product or look on the product packaging for an expiration date. Most manufacturers have a Web site address on the packaging and/or a toll-free telephone number. What insects will DEET-based repellents repel? DEET helps repel biting flies, ticks, gnats, no-see-ums and chiggers. I have technical questions about DEET. Go to Contact Us for quick email access and phone numbers. Where can I get free samples of DEET-based repellents? We don’t make DEET-based formulations here at Vertellus…we make the DEET that other companies use to create repellent products. Contact the various repellent manufacturers. The DEET Education Program has brochures that are free of charge. You can order as many as you need online at www.deetonline.org or 888-NO-BITES. These are available in English or Spanish and come in a “family” or “senior” version. The brochure is on line.